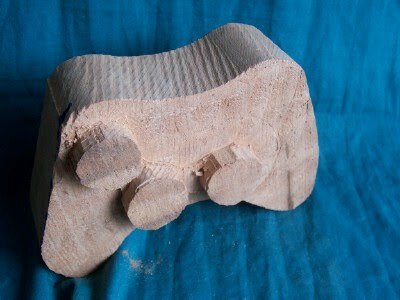 I've accepted my first paying commission to create a sculpture in wood, a gentleman from California approached me to make a wooden (non-working, duh!) 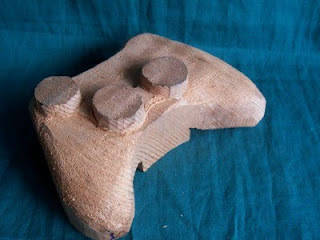 version of an XBox controller. Well, that's just far enough outside the box that I could not say no. And I got to go shopping at the Hardwood Store, too. 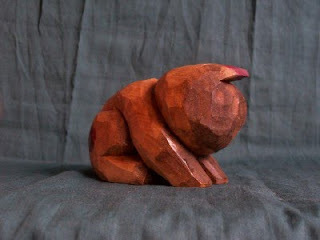 If you are ever in the neighborhood, stop by Buffalo Hardwoods at the intersection of Main & Kensington in Amherst, NY. Half the space is hardwood storage, half is wood shop, they always have time to listen to whatever project I have in mind, and often are building something interesting themselves. I didn't get any compensation for this blurb, I just like 'em. Candy store for me, you know? 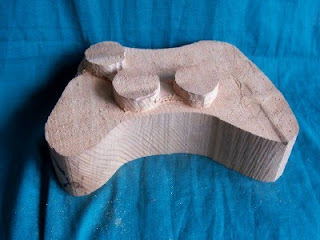 I went in looking for something special, with some wild or strong grain so there'd be no doubt my controller was made of wood. I walked out with a small chunk of redwood cut from the root of an enormous tree-(Yeah, I bought softwood at the hardwood store). They had two slices there cut from the same root, nearly 4'wide and 8'long, each 3" thick- I figure the root must have been 4' around, am guessing the tree was up to 20' diameter at the base. There is no bark on any of the outer edges, the outside couple inches of the tree are decaying and show signs of fire. Years ago when Redwoods were regularly felled, giant trees would commonly be cut leaving an 8' or taller stump in the forest. Lately some loggers have been going into the woods and harvesting these decaying stumps; I suspect that is where my little chunk came from. In addition to the wild grain, it has the advantage of hailing from the buyers home state. So first things first- bandsaw the rough shape. the original piece is 3" thick, so I cut a slice off to get down to the 2+ inches I'll need. Next thing is to identify the high spots, in this case it's the 3 mounds that surround some of the buttons and joysticks. I left them large and high, plenty of time to refine them later. Sitting high like they do, they are likely to incur a bit of damage while I shape the rest of the piece too. I used a router and then a router bit in my drill press to get to this point- no carving yet. 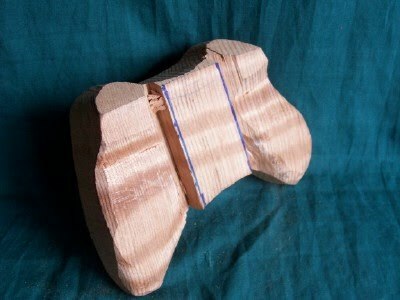 Next step is to begin to rough in the details- shape the handle area, rough saw the battery box on the bottom. some knife work, some rasp work. You can see the grain starting to show, I have a plan for that, but I'm not talking yet. 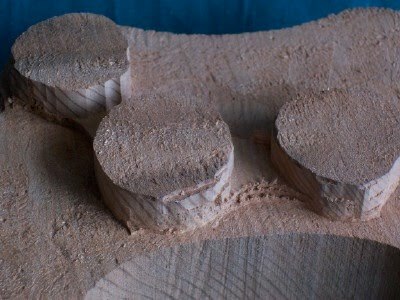 Ive done some saw work and some knife work on the back/bottom, and you can see why I picked this piece of wood- its curly, tight strong curl too, a rarity. For those who do not know wood, curl is those alternating lines of light and dark. They're caused by grain that does not grow in straight lines but undulates through the piece. If you rotate the piece, the dark and light bands will switch- it's pretty amazing. The front half is so roughed up you can't see them, they're there and they'll pop when I finish the wood. I just realized I posted photos for my client, who is a professional photographer. Don't laugh too hard, OK? Rose Breeders have been trying to create ( thruough selective breeding) a truly Black Rose for years, decades, maybe even centuries. I grow a few roses in my garden (none of them black), I recall reading about a large prIze, a million dollars I think, for the first truly black rose. 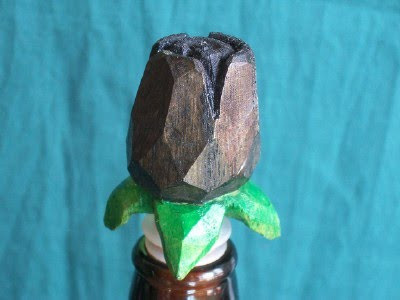 I've done one other rosebud bottle stopper (see post of July 29, 2010), my inspiration was a little faceted glass rosebud my daughter brought home from the mall one day. The facets did not work out so well on the first, but I think I came closer to nailin em on this one. Are they even, or symmetrical? Not really, they won't pass the micrometer test, but they look like I want em to- pretty even, and obviously hand made. 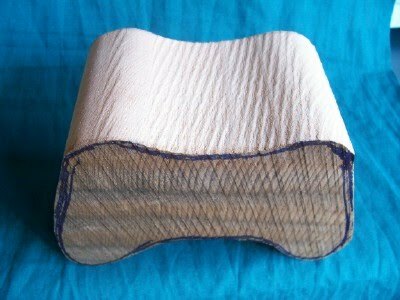 I considered getting my layout squares and rulers out to make the facets as nearly perfect as possible, but decided tools like that have no business in Whittling. Thanks for looking. Go whittle something. I finally got around to making myself another knife. I'm like the mechanic with the junker car, too busy making knives for others, never seem to get around to making one for me. The wood is spalted poplar, like the one I show in my last post. Same wood, different camera settings. Thin blade, little tilt to the edge. If I'm gonna make a knife, it has to be something I can't find. I've discovered I don't care about the size or shape of the handle, as long as the knife is scary sharp. If it's dull no handle will be comfortable. I did not spend much time on the handle, the thin blade is new for me and I did not want to spend too much time on a knife I might not like. On the other hand, if I ended up with a keeper, I wanted the handle to be special. Before I decided to make my own knives, I searched the web looking for the perfect knife, I saw a lot of nice knives, made by real artists, with sculpted handles, knives whose blade supported the design of the handle. I also saw figural jackknives, trucks and baseball bats and ladies boots, fish and dogs and nudes..... They caught my fancy, the thin material I used for this knife is easy to put into a wooden handle, so if I like the knife there is a new world of sculpted knives out there. I have half a dozen finished designs, and a bunch more sketched ideas in my notebook. 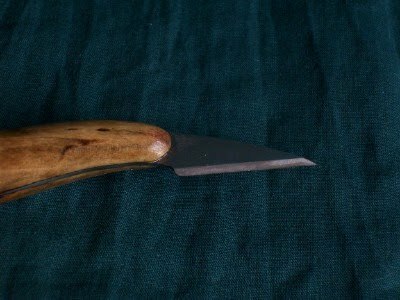 I got to spend a few hours whittling with it, it cuts nice. I've almost finished the knights for my chess set, I'm pretty pleased with the way it performs. Time will tell. I regularly make knives from files, and wrap the handles with leather cord, but decided to try something new. 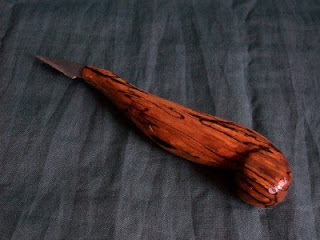 The handle here is spalted poplar, the colors and pattern are caused by a fungus that invades the wood. Too much spalt and you get decay, somewhere between healthy wood and punky wood you get a sound piece with amazing color patterns. I call this my Schmoo knife, which dates me I'm afraid. Anybody out there remember the Schmoo from the Lil' Abner comic strip? Used to read it every Sunday as a kid. Google it if you want. The blade is a new material for me too- it's a floor scraper blade, you can buy them from the big box home improvement type stores. They mount in a tool one would use to remove linoleum from a floor you wanted to re-do. They're hardened steel, half inch or so wide, 8 inches ling and .035 inches thick. That's bout half the thickness of the blades I generally make from files, and they tend to flex a bit. They are softer than my files too, I'd guess RC 59 or 60 (estimate files to be RC63 or more), so they can flex a bit without breading. They're easy to grind, the blank fits in a bandsaw slot. A little epoxy and away you go. 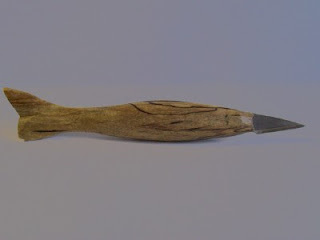 I tried to make the handle and the blade flow together- most wood handled knives are a piece of steel stuck in a hole in the end of a piece of wood, and they look it. I also kept the circular feature at the pommel end I use in my leather wrapped knives, a little 'signature' item for me. I could wish for better pics, the color is less than true and the overall shape of the knife is less than clear. 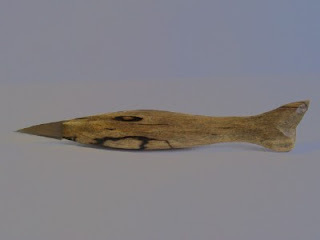 The photographed side of the knife is the more spectacularly spalted side, the opposite side lost it's pattern as I carved. it was bound to happen, Murphy says so. I'm glad one side held the coloring so well. So, Whittle on, even if you only have a Whittle time- the chores can wait. Is the first I've done, and another commission. My daughter asked for one, since she pretty much never asks, she got it. 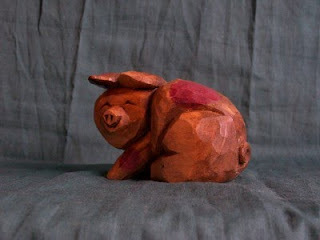 He's basswood, 2"x3"x3-1/2" more or less. She picked the color scheme, tho she did not pic purple spots. They started brown, I used acrylics and mixed red & green till they looked like a real nice brown on my salad plate. When I put them on the wood they turned reddish, and when I covered them with Walnut Minwax stain they turned purple. She laughed when she saw it, so I left it like it is. artial success I think. The idea is to cut deep to accentuate the relation between body parts. My interpretation was to cut deep vees to outline the back leg, separate the front leg from the head, etc but keep it simple. Piggy has a couple other firsts for me too- first time I tried to turn a figure's head, new style of eyes for me too. I like the eyes, the head worked out pretty well too. Overall I like him- it appeals to my preference for simple pieces. Like most new things I do, I look forward to improving on it in future pieces.